US scientists have managed to rid diabetic mice of the effects of the disease using a cocktail of drugs. The mice, who had type 1 diabetes, started producing their own insulin after taking a mixture of four drugs. Previously the same team at Harvard University had only been able to stop the destruction of the cells which make insulin, not regenerate them. But in a study reported in the New Scientist, they say adding another drug to the original cocktail did just that. They now hope to start trials in humans. Type 1 diabetes is usually managed through regular injections of insulin and until now, research into a cure has focused on transplanting the pancreatic beta cells which produce the hormone from donors. However this is complicated - both because of the difficulty in finding a donor and the problems of rejection - so regenerating a person's own cells is seen as far better option. Last year, Dr Terry Strom and his team demonstrated that they could stop the on-going destruction of insulin-producing beta cells in mice using a combination of three drugs, although they were unable to regenerate the cells. However, when they added an extra ingredient - an enzyme called alpha 1 anti-trypsin - a significant rise in the number of beta cells was seen. It is thought this extra drug may ease the inflammation of pancreas, a key feature of the disease. "It would appear that by altering the inflammatory state that surrounds this autoimmune disease, you can create an environment that enables expansion of the beta cell mass," said Dr Strom. He added that it was too early to say whether the beta cells which had stopped making insulin had recovered, or whether new ones were being produced. 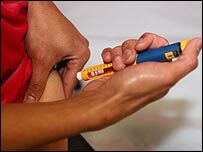 Dr Iain Frame, director of research at Diabetes UK said: "This could potentially be very important research in finding a better treatment for diabetes. "More research is needed as initial studies have only been conducted in mice, but Diabetes UK is pleased that clinical trials are planned and look forward to hearing the results."